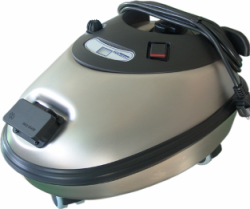 The Aquaclean CS TR5 is a light use industrial steam cleaner also suitable for domestic use where higher performances are required. It has a tough stainless steel body, stainless steel boiler, & comfortable carrying handle with cable storage, which makes it suitable for multi purpose cleaning / disinfection tasks both indoors & out. Hospitals & nursing homes, GP's & Dentists, contract cleaners, supermarkets & delis, restaurants & kitchens, hotels & bed breakfasts, pharmacuetical, meat plants & bakeries, fitness centres & gymnasiums, car cleaning, schools & creches, & much, much more!!! Ovens, grills, microwaves, deep fat fryers, fridges, defrost freezers, stainless steel counters / canopies & fittings, tiles & grouting, hard floors & walls, carpets & upholstery, mattresses, shower & toilet areas, exercise equipment, windows & mirrors, cars (engines,body, wheels, trim, interior), chewing gum removal, parts & machinery, conveyor belts, & much,more!! !